After all... these dreary days I felt the need for a little sunshine this morning. Handcrafted vintage chic necklace featuring a pastel yellow floral rose bouquet cameo cabochon in a lace filigree setting, pale orange butterfly & lilac tulip charms all of which is accented with a little antique brass bow.. 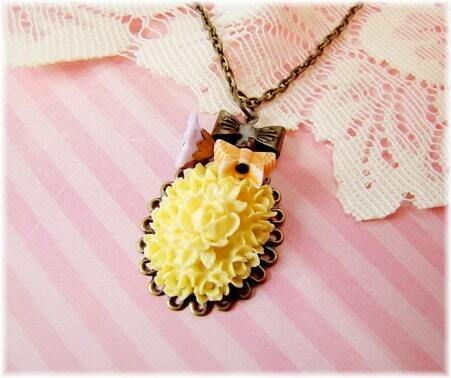 This is a very sweet and romantic little necklace. Floral cameo necklace measures 20” length, not including the cabochon which measures 1” in length.